I have been asked about some of the symbols seen in photo and video reportage about the unfolding events in Ukraine, in an effort to sort out which side is which. Some have noticed the presence of ribbons – orange and black striped – affixed to the uniforms of varied camouflage patterns worn by the actors in and around the occupied sites of government buildings in eastern Ukraine. That would be the ribbon of Saint George, with the colors symbolizing fire and gunpowder, and now a makeshift indication that the wearer is pro-Russian. It comes from the old Order of Saint George, established by Catherine the Great as a medal for bravery in combat, and the colors were apparently taken from the imperial shield that had a black eagle on a golden background. The order and medal were disestablished with the Bolshevik Revolution, along with anything else that was historically Russian, but the ribbon was re-established to some degree in World War II when it was found that Russians simply weren't enthusiastic about fighting for Communism, but would fight for the glory of Mother Russia. The medal was fully re-established by Boris Yeltsin. The Red Banner of the Guards units in the Soviet Red Army, designating famous units and their valor in combat, has been replaced with stripped banners of orange and black. 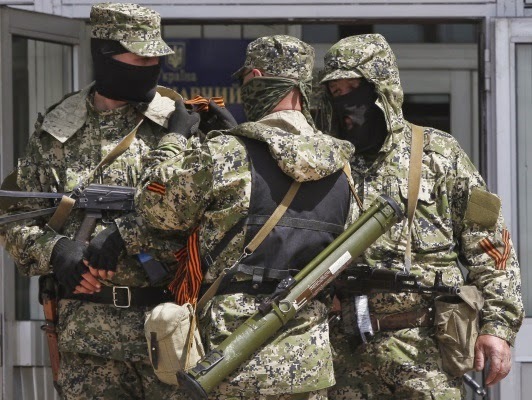 This goes along with the black balaclavas of the pro-Russian separatists, the "little green men" as the Ukrainian government has called them, and laughably called "spontaneous" by Putin and his apologists. The balaclava is now the most popular fashion accessory in that area since the invention of pants. On the other side, demonstrations with the Ukrainian flag of blue and yellow (blue sky, yellow wheat fields) are sometimes supplemented with other flags of red and black (red Ukrainian blood, black Ukrainian soil) that hearken to the Ukrainian Insurgent Army (or Ukrayins’ka Povstans’ka Armiya, UPA [УПА]) of World War II. It has a very chequered past, dedicated to Ukrainian independence by alternately fighting Nazi, Soviet, and Polish armies in an often rapid spiral of realpolitik, thus alienating practically everyone around it except for Ukrainian nationalists. This is why you see and hear Russian accusations of "fascists" and "Nazis" applied to the Ukrainian movement, and the contending factions see in the flag what they want. The Ukrainian national emblem is a trident symbol – the tryzub – that goes back to Vladimir the Great of a thousand years ago, symbolizing the triune God. Vladimir is to Ukraine what Constantine is to the Roman Empire, the first monarch to bring Christianity to his land. The Donetsk separatist flag has been resurrected as well from the chaotic days of the attempt to establish an independent Soviet republic in the area after the Revolution of 1917, one particularly independent from Ukraine. It was unsuccessful though it saw early and brief Russian support until it became consolidated into the Soviet Ukraine in 1918. It is not surprising that the idea would be revived with recent events, supported by a spirit of irredentism. 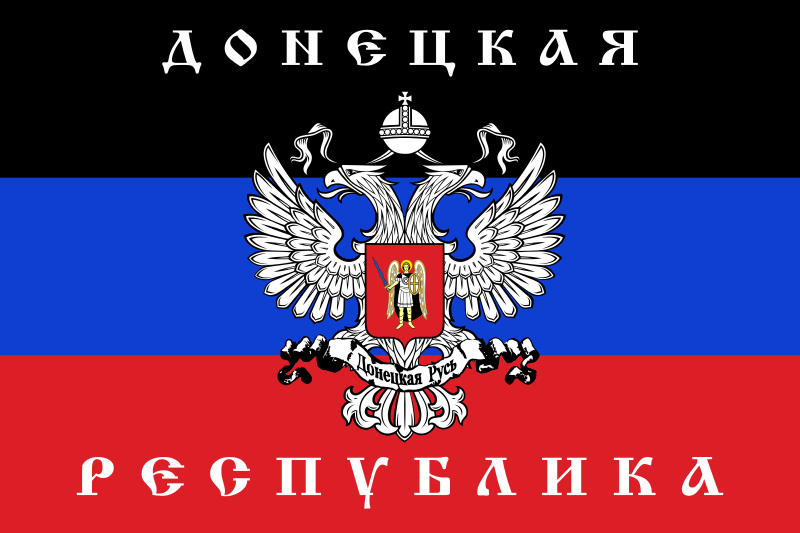 The basic flag of black-blue-red is a play on the classic Russian flag of white-blue-red, and I would expect that the black was a nod to the local Black Army of anarchists under Nestor Makhno that fought in the swirling Russian Civil War that followed the Revolution. Unfortunately, it would seem that another major clue is that any military unit equipped in abundance with modern weaponry and equipment clearly is not Ukrainian.